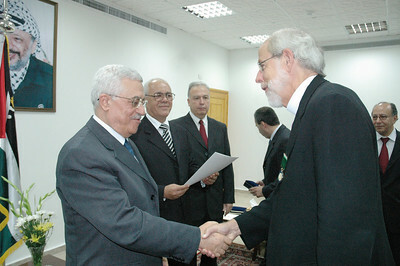 Palestinian Authority President Mahmoud Abbas, left, shakes the hand of ELCA Presiding Bishop and LWF President Mark Hanson after presenting Hanson the "Bethlehem 2000" medal in recognition of his work for peace, justice and reconciliation, for promoting interfaith relations and for his efforts on behalf of the Palestinian people. Abbas made the presentation Sept. 3 during a meeting with LWF leaders in Gaza City. 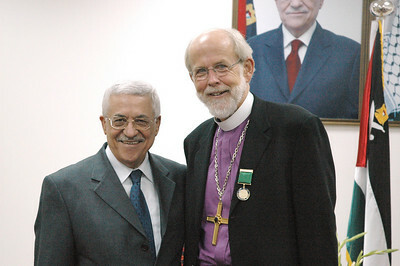 ELCA Presiding Bishop Mark Hanson, right, was one of the three LWF leaders who met with Palestinian Authority President Mahmoud Abbas, left, in Gaza City Sept. 3. 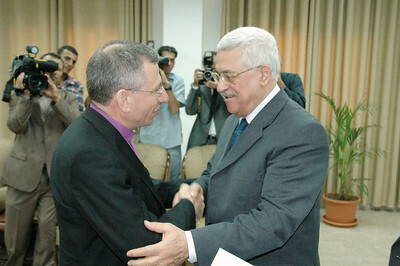 Palestinian Authority President Mahmoud Abbas, right, presents Bishop Munib Younan, who is also LWF vice president, with the "Bethlehem 2000" medal in recognition of his work for peace, justice and reconciliation, for promoting interfaith relations and for his efforts on behalf of the Palestinian people. Abbas made the presentation Sept. 3 during a meeting with LWF leaders in Gaza City. ELCA Presiding Bishop and LWF President Mark S. Hanson, left, converses with Palestinian Authority President Mahmoud Abbas, right, during a meeting Abbas hosted with LWF leaders in Gaza City Sept. 3. Israel's Minister of Foreign Affairs, Silvan Shalom, right, greets ELCA Presiding Bishop and LWF President Bishop Mark Hanson, during a brief meeting with LWF leaders Sept. 5 in Jerusalem. "For us, it is very important to move to a better future, with peace and quiet," Shalom told the Lutherans, adding that Jews and Christians should have "close" relationship. Israeli President Moshe Katsav, left, met with LWF leaders including ELCA Presiding Bishop and LWF President Mark Hanson, right, at Katsav's offices in Jerusalem Sept. 5. 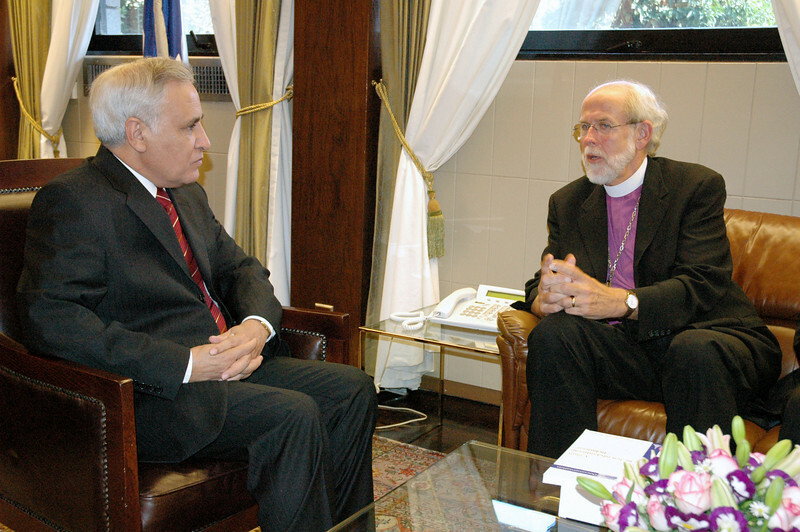 The Lutherans and Katsav discussed prospects for Middle East peace and expressed specific financial concerns about the future of Augusta Victoria Hospital in a 35-minute meeting. 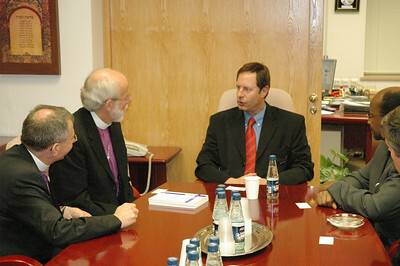 Israel's Minister of the Interior, Ophir Paz-Pines, seated at head of table, hosted LWF leaders at a brief meeting at his offices Sept. 5 in Jerusalem. With Paz-Pines are, from left, Bishop Munib Younan, LWF vice president and ELCA Presiding Bishop and LWF President Mark Hanson. The LWF leaders visited a variety of Israeli and Palestinian political leaders in the region during the LWF Council meeting in Jerusalem and Bethlehem Aug. 31-Sept. 6. 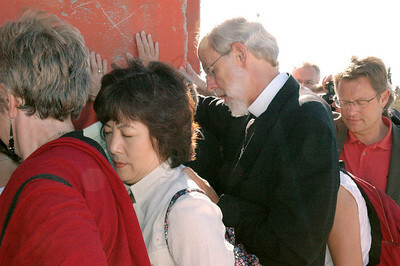 At a Morning Prayer service Sept. 6 in Bethlehem, members of the LWF Council pray at the Israeli separation wall. Among the participants was ELCA Presiding Bishop and LWF President Mark Hanson. During the service, council members and staff placed their hands on the wall and prayed for peace, justice and reconciliation between Israelis and Palestinians.